BACKGROUND AND PURPOSE: Hemangioblastomas (HBs) are rare lesions accounting for 1–5% of all spinal cord tumors. Seventy-five percent of spinal HBs are intramedullary. Lesions of the conus medullaris and the cauda equina are uncommon, and the filum terminale location is very rare. HBs of the lower spinal region are highly vascular tumors requiring surgery that is potentially complicated by excessive bleeding. In the literature, there are few reports concerning preoperative embolization of HBs, and only few cases are reported in spinal location. Presurgical embolization of HBs located in the lower spinal region has not been described. Although lower spinal HBs are predominantly fed by the anterior spinal artery (ASA), embolization of these lesions is possible and can reduce tumor vascular supply, thus facilitating surgery. We report our experience in four rare cases of solitary HBs occurring in the lower spinal region. METHODS: Clinical charts and radiologic studies of four patients with a preoperatively embolized HB of the lower spinal region were retrospectively reviewed. The lesions were located in the conus medullaris in one case, at the level of the cauda equina in another, and in the filum terminale in two. In the conus medullaris case, the neoplasm was associated with a syrinx. In three patients, the HB was sporadic, while the patient with the HB of the cauda equina had Von Hippel-Lindau disease. Devascularization of the tumor was performed through the ASA in all cases and also through the posterior spinal artery in one by using non reabsorbable calibrated microspheres in three cases and polyvinyl alcohol particles in the other one. 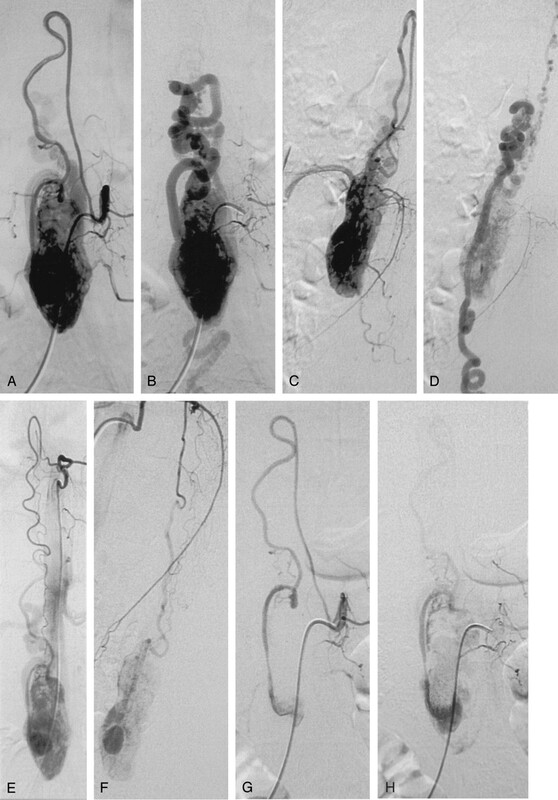 RESULTS: Embolization caused no permanent complications, although one patient with a cauda equina HB mildly worsened after the endovascular procedure but recovered before surgery. At surgery, the tumor was completely removed in all cases. Blood loss was reported to be less than usually observed (100, 200, 200, and 400 mL). In addition, manipulation and removal of the tumor was reported to be easy in three of four tumors. Histologic examination confirmed the diagnosis. At 1-year postsurgical follow-up, two patient recovered completely from neurologic deficits, and two showed significant recovery. No tumor recurred during a follow-up period of 1–6 years (mean, 3.5 years). CONCLUSION: Our results indicate that preoperative embolization of HBs of the lower spinal region is an useful procedure in aiding surgical resection of these highly vascular tumors. With a meticulous technique, embolization can be performed through the ASA. Hemangioblastomas (HBs) are rare tumors located in the cerebellum in three-fourth of cases, whereas one-fourth are located inside the spinal canal (1, 2). These lesions may arise in isolation (“sporadic” cases) or as a manifestation of von Hippel-Lindau (VHL) disease, which is found in approximately one-third of patients. HBs account for 1–5% of all spinal cord tumors. Seventy-five percent of spinal HBs are intramedullary, usually located in the posterior half of spinal cord, and another 10–15% have combined intramedullary and extramedullary-intradural components (3–5). Extramedullary-intradural HBs are often attached to the dorsal spinal cord pia, and, in some cases, lesions can arise solely from nerve roots (6, 7). Extradural tumors are very rare (4, 8, 9). Most of the intramedullary or extramedullary spinal HBs are reported in cervical or thoracic location. The lesions reported in the conus medullaris (10–14) or in the extramedullary compartment adjacent to the conus medullaris (15) are rare, tumors of the cauda equina (1, 16–19) are uncommon, and lesions of the filum terminale (20–22) are extremely rare. HBs of the lower spinal region are highly vascular tumors predominantly fed by the anterior spinal artery (ASA), also known as the artery of Adamkiewicz. These lesions require surgery that is potentially complicated by excessive bleeding. Embolization can reduce tumor vascular supply facilitating surgery. The literature contains few reports concerning preoperative embolization of HBs. With regard to location, treated lesions were more often in the cerebellum (23–27), five in the brain stem (1, 24, 30), and eight cases in spinal location—five in the cervical spinal cord (23, 28, 29) and three in the thoracic region (23, 26). Few other cases of embolized HBs are reported in other articles not specifically dealing with preoperative embolization (1, 14, 30). 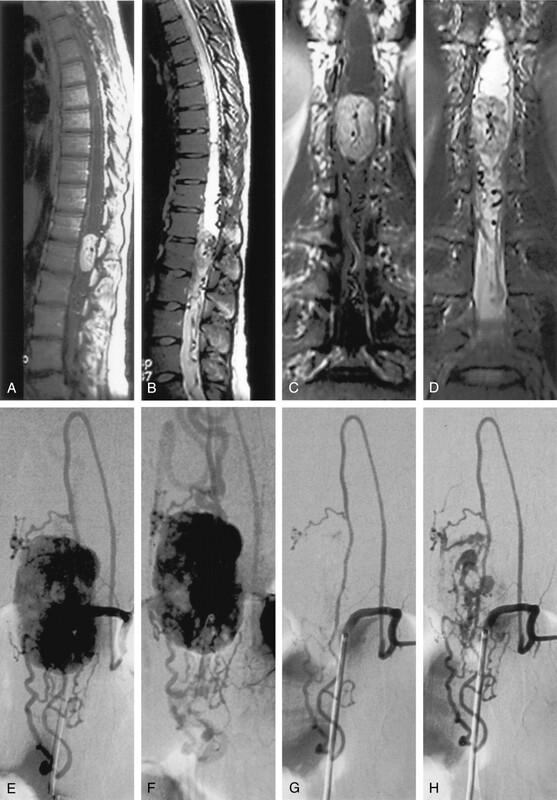 To the best of our knowledge, presurgical embolization of HBs located in the lower spinal region has not been reported, and, in the published cases, devascularization was never performed through the ASA. We report our results of preoperative embolization through the anterior spinal axis in four rare cases of solitary HBs occurring in the conus medullaris, cauda equina, and filum terminale. Clinical charts and radiologic studies of four patients with a preoperatively embolized HB of the lower spinal region were retrospectively reviewed. There were two female and two male patients ranging 24–61 years of age (mean age, 43 years). The lesions were located in the conus medullaris in one case (case 1), at the level of the cauda equina in another one (case 2), and in the filum terminale in two (cases 3 and 4). In the conus medullaris case, the neoplasm was associated with a syrinx. In three patients, the HB was sporadic and family history and screening for other manifestations of VHL disease were negative. One patient with an HB of the cauda equina (case 2) had VHL disease, including two retinal angiomas and a family history of VHL (the mother and a cousin). All patients had a prolonged history of progressive and severe back pain associated with unilateral sciatalgia in three cases. Clinical findings also included sensory and sphincteric disorders in the patient with the conus medullaris lesion (case 1), a moderate cauda equina syndrome in the patient with the cauda equina lesion (case 2), and sensory and motor disturbances in one of the two patients with an HB of the filum terminale (case 3). In all patients, MR imaging displayed typical intense and homogeneous enhancement of the mass with tortuous vessels suggesting the diagnosis of a HB. In all cases, selective spinal angiography revealed a lesion consistent with a vascular tumor and also compatible with the diagnosis of HB. Spinal angiography included selective catheterization of the lower thoracic intercostals arteries, lumbar and sacral arteries to define the vascular supply to the tumor, and the spinal structures through the anterior and/or posterior spinal arteries and also to study the anterior spinal axis. Embolization was performed through the ASA in all cases (Figs 1–3) and also through a posterior spinal artery in the lesion of the conus medullaris (case 1). In two cases, a microcatheter was coaxially introduced in the 5F guiding catheter, thus allowing a more selective catheterization of the feeding artery. In three cases, the tumor nidus was devascularized by using nonreabsorbable calibrated microspheres (trisacryl gelatin) ranging from 300 μ to 700 μ in diameter (BioSphere Medical; Roissy, France) and, in one case, by using polyvinyl alcohol (PVA) contour particles (Boston Scientific, Fremont, CA) from 250 μ to 900 μ. Particles were diluted in contrast medium and saline solution and injected slowly by low pressure hand injection under subtracted fluoroscopy. Repeated control angiograms were performed to evaluate the tumor devascularization and the spinal arteries hemodynamic changes. The procedure was stopped when significant reduction of the tumor stain was obtained. Other criteria included the observation of a very slow filling of the residual tumor associated with a slower filling of the ASA and faster filling of branches feeding normal structures. Tumors were operated 2–6 days (mean, 3.7 days) after the endovascular procedure. Histologic analysis of the lesion was available in all cases. Case 1. Hemangioblastoma of the conus medullaris in a 24-year-old woman. Sagittal (A) and coronal (C) T1-weighted MR images after administration of gadolinium show marked and enhancement of the tumor located at level of T12–L1 vertebral bodies. The lesion is associated with an intramedullary cyst extending to the middle thoracic region. On sagittal (B) and coronal (D) T2-weighted MR images, the lesion is predominantly isointense, heterogeneous with flow void due to high-flow vessels. The intramedullary cyst is better visualized. Multiple serpiginous images are observed compatible with dilated vessels. 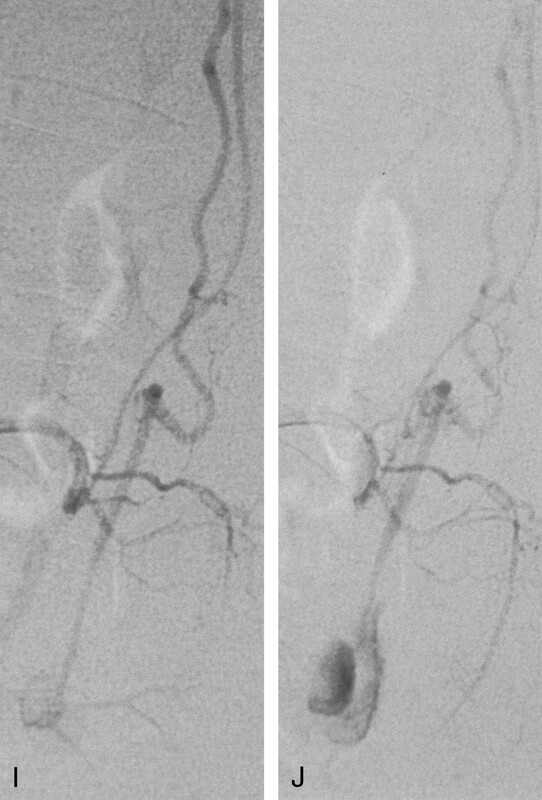 Before embolization, angiography of left first lumbar artery, early (E) and late (F) phase, shows that the tumor is predominantly fed by the ASA and by the right posterior spinal artery from the right third lumbar artery (not shown). A very slight vascular supply was also observed from the left posterior spinal artery originating from the left T11 intercostal artery (not shown). Embolization was performed through the ASA (artery of Adamkiewicz) from the left first lumbar artery. After embolization, angiography of the left first lumbar artery early (G) and late (H) phase, shows reduction of the tumoral blush. I, Right third lumbar artery angiography shows a residual tumoral blush fed by the posterior spinal artery. J, After embolization of this pedicle, no tumoral blush is observed. Case 2. Hemangioblastoma of the cauda equina in a 47-year-old woman with VHL disease. Selective spinal angiography of the left second lumbar artery (A–D) shows the ASA (artery of Adamkiewicz) feeding the tumor (A, early, and B, late phase in anteroposterior view; C, early, and D, late phase in lateral view). Selective angiography of the left T10 intercostal artery (E, anteroposterior; F, lateral) shows an additional supply to the anterior spinal axis from a thoracic radiculomedullary artery. The left T10 intercostal artery also gives rise to a left posterior spinal artery (Lazorthes artery) providing a slight supply to the superior pole of the tumor. Descending anterior and ascending posterior venous drainages are observed. Embolization was performed through the anterior spinal axis from the left second lumbar artery. After embolization, selective spinal angiography of the left second lumbar artery (G–J) shows reduction of the tumoral blush tumor (G, early, and H, late phase in anteroposterior view; I, early, and J, late phase in lateral view). Case 3. Hemangioblastoma of the filum terminalis in a 61-year-old man. Sagittal (A) and coronal (B) T1 MR images after administration of gadolinium show marked enhancement of the tumor located at level of L3 vertebral body. C, On sagittal T2 MR image, the lesion is predominantly isointense, heterogeneous with flow void due to high flow vessels. D, Angiography of left first lumbar artery shows that the tumor is fed by the anterior spinal axis. E, Intermediate step of embolization performed through the ASA (artery of Adamkiewicz) shows partial reduction of the tumoral blush. F, Final control angiography of the left first lumbar artery shows angiographic tumoral devascularization. The embolization allowed marked decreased in tumor vascularization and significant reduction of the tumor stain from the main feeders in all four patients (Figs 1–3). The advantages of calibrated microspheres over PVA particles included uniformity of spherical shape, precisely calibrated size range, easier transmicrocatheter delivery, and greater penetration. Embolization by using calibrated microspheres allows a more permanent devascularization of the lesions. Thus, surgery does not need to be performed early after the endovascular procedure. No particle aggregates or microcatheter obstruction occurred in any procedure including that performed by using PVA particles. Embolization caused no permanent complications. 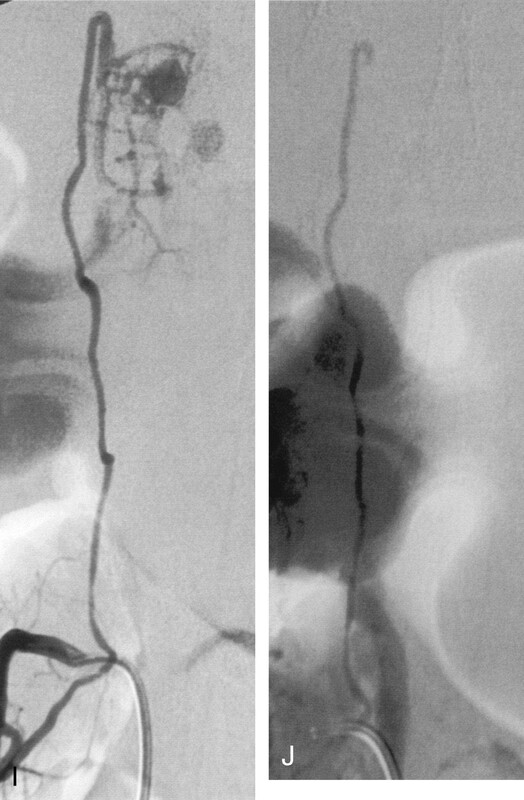 The patient with the cauda equina HB, however, presented a transient and moderate worsening that appeared some hours after the endovascular procedure. This patient rapidly recovered before surgery with corticoid therapy. At surgery, the tumor was completely removed in all cases. Blood loss was reported to be less than expected by experienced surgeons (100, 200, 200, and 400 mL, respectively). In addition, manipulation and removal of the tumor was reported to be subjectively easy in three of the four embolized tumors. One patients had a temporary worsening after surgery, and surgery for a postsurgical meningocele was performed. In all cases, histologic examination confirmed the diagnosis of HB. At 1-year postsurgical follow-up, two patients recovered completely from neurologic deficits and two patients showed good clinical recovery and had improved compared with preoperative status. Three patients had complete postoperative pain relief and one patient had occasional mild lumbar pain. None of the patients developed symptoms or signs suggesting a recurrence during the follow-up period, which ranged from 1 to 6 years (mean, 3 years). We reported four rare cases of histologically proved solitary HBs at level of the lower spinal region removed after preoperative embolization. HBs have been reported in isolation (“sporadic” cases; 4, 7, 11, 18, 21, 26, 31, 32) or as a major manifestation of VHL disease (4, 6, 18, 31–37), a condition with a prevalence of 1/36,000 (2, 38). VHL disease is an autosomal dominant disorder whose hallmarks include CNS HBs (cerebellum, spinal cord, and retina) and clear cell renal carcinomas. Affected subjects may also have angiomatous or cystic lesions of the kidneys, pancreas, and epididymis, as well as endolymphatic sac tumors and adrenal pheochromocytomas. In VHL disease, CNS HBs and renal cell carcinoma are the main causes of death (38). In three of our cases the HB was sporadic, whereas one patient had VHL disease. Some studies (38, 39), however, have revealed that VHL-related HBs are probably much more frequent than is generally supposed and systematic genetic studies should be performed in all patients with a HB. VHL disease is caused by germline mutations of the VHL tumor-suppressor gene located on the distal part of the short arm of chromosome 3 (3p25–26). This gene, encoding for a 213–amino acid protein, plays a major role in the regulation of vascular endothelial growth factor expression (38, 39). This finding explains the highly vascular nature of the HBs. In addition, spinal HBs associated with intramedullary (40) or subarachnoid (4, 41–43) hemorrhage have been described. In a large 10-year study of about 213 cases of HBs (2), it was found that patients with VHL disease tend to present with neurologic symptoms at a younger age than do patients with sporadic disease and to develop new lesions. In spinal location, multiple lesions have been reported usually in patients with VHL disease (1, 7, 44). A particular condition—called “spinal leptomeningeal hemangioblastomatosis”—with multiple small tumors has also been described (33, 45). Spinal HBs are more often (50% versus 36.6%) related to VHL disease than are infratentorial locations (1). In our series, the patient with the cone medullaris HB had no VHL disease. In the literature, isolated lesions of the conus medullaris are reported in patients with and without VHL disease (10–13, 15). Our patient with a cauda equina HB had VHL disease, and this finding is in accordance with the literature in which the tumors of the cauda equina are usually observed in patients with VHL disease (16, 18, 19). In a recent report, Da Costa et al (17) reported the second case studied with MR imaging of an histologically proved HB of the cauda equina in a patient without clinical criteria for VHL. Regarding the lesions of the filum terminale, only five cases have been reported in the literature before the MR imaging era (21), and, in three more recent cases (20–22), the HB was sporadic. In our two lesions of the filum terminale, the patients had no VHL disease and the family history was unremarkable. In our patients, however, complete genetic molecular analysis was not performed. All our patients underwent a MR examination. MR imaging findings (Figs 1 and 3) were characteristic of and compatible with those reported in the literature (31). According to the literature (4, 11, 20, 35, 36, 46–51), MR imaging allows an accurate diagnosis of spinal HBs and associate cysts, which are reported in 70% of intramedullary cases. Symptomatic small HBs have been reported to have relatively large associated syringes, whereas asymptomatic ones did not (31). MR imaging is also an excellent way to check multiple lesions and follow patients (4, 35, 37). There is no difference in the MR imaging findings between patients with or without VHL disease except for the multiplicity and higher percentage of small tumors in patients with VHL (31). Some authors (35) affirm that MR imaging is the diagnostic technique of choice and angiography should not be performed. Spetzger et al (12) state that, although MR imaging is essential for preoperative diagnosis, spinal angiography is also mandatory because it allows a detailed study of the vascular condition, which is decisive for exact planning of a surgical strategy. In some series (11, 30), angiography has been performed in almost half of cases. In a recent series, Lee et al (14) report that preoperative angiography was performed in 11 out of 14 cases. 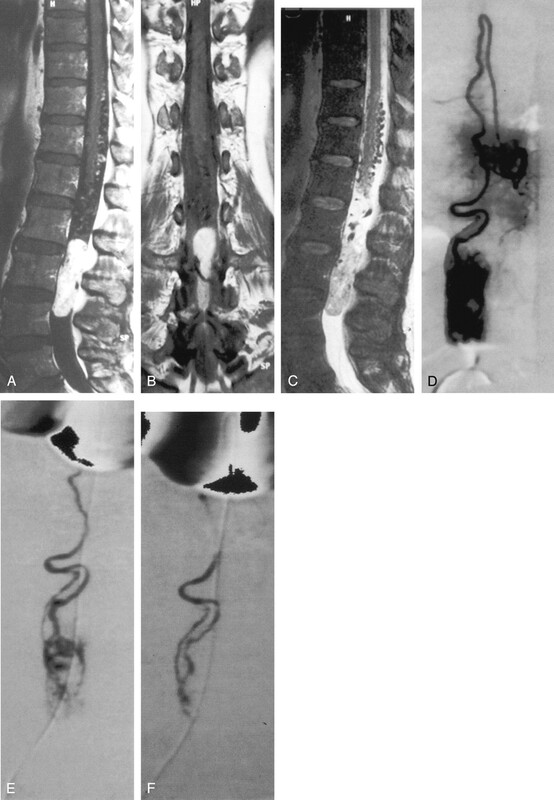 Brisman et al (15) consider angiography to be the criterion standard in the diagnosis of spinal HBs, and it is useful in some cases in which differential diagnosis with vascular malformations could be difficult. These authors suggest that the angiography should be performed by a neurointerventional team capable to perform presurgical embolization. In general, HBs of the spinal cord and lumbosacral nerve roots should be removed when they become symptomatic (19, 52). In case of cauda equina lesions, these neoplasms appear to originate from the nerve root and it is necessary to sacrifice the nerve root from which the HB originates to achieve complete resection (19). Symptomatic patients should undergo surgery before they develop extensive sensory-motor deficits (32). Pietila et al (53) state that, with the new diagnostic tools now available, microsurgical removal of spinal HBs has a low morbidity rate and suggest that surgical treatment should be considered even for asymptomatic HBs in certain circumstances. Thanks to improved surgical techniques, good results based on microneurosurgical centers’ experience support the concept that radical excision of spinal HBs can be achieved at low levels of surgical mortality and morbidity (11, 53–56). Malis (56) describes a unique microsurgical technique of bipolar coagulation that offers a safe and relatively easy tumor removal. A bipolar forceps is used to shrink each tumor and detach it from its feeding and draining vessels. In Malis’s report, tumor resection was successfully accomplished in all patients. No bleeding occurred during tumor removal, and no transfusions were given. Despite progress in microsurgical techniques, however, surgery of HBs remains challenging and is often complicated by massive bleeding, especially in large tumors running over more than one segment and in tumors located in the lower spinal region. In a relatively recent report, Conway et al (1) report that, in 66 procedures of CNS HBs, surgical complications occurred in 15% of patients. Cristante et al (32) report that the functional status at discharge of the patients operated for an intramedullary HB was worse in 23%, unchanged in 59%, and improved in 18% of the patients. At follow-up (6–142 months), the status of 9% of the patients was still worse, unchanged in 50%, and better than the preoperative one in 41% of patients. Wang et al (30) report rates of 5% mortality and 13% postoperative complications in 47 patients treated surgically for medullary HB. In the series of Lee et al (14), total removal was achieved in 10 of 14 spinal HBs, and statistical analysis showed that total removal produced a significantly better outcome than incomplete removal. In four of their patients with preoperative embolization, intraoperative bleeding was minimal and total removal was possible. At the last follow-up (15–161 months), eight patients had improved, three were unchanged, and three had deteriorated. The goals of preoperative embolization are control of inaccessible arterial supply and reduction of tumor vascularity. Reduction of intraoperative bleeding is important because excessive bleeding might prevent complete resection of the tumor (14, 24). Conway et al (1) recommend embolization in patients with HBs fed by vessels that are located away from the surgical approach and are not expected to be encountered immediately during resection. In literature, there are few reports concerning preoperative embolization of HBs. Regarding location, most of the embolized lesions were in the cerebellum (1, 23–27) and five lesions in the brain stem, in three anatomic areas: pontomedullary, medullary, and cervicomedullary (1, 24, 30). In spinal locations, eight cases have been reported: five in the cervical spinal cord (23, 28, 29), usually located in the upper cervical cord or at the cervicomedullary junction, and three in the thoracic region (23, 26). Few other cases of embolized spinal HBs have been reported in other articles not specifically dealing with preoperative embolization, and results are not detailed: Lee et al (14) mention preoperative embolization in three cervical HBs and one low thoracic lesion. Conway et al (1) report that, in one sacral HB, embolization arrested symptoms progression 1 month after treatment and surgery was not necessary. After preoperative embolization, facilitated operative excision and complete surgical resection of tumors are usually reported, as observed in our cases (14, 23–26, 29). To the best of our knowledge, there are no articles reporting methods and results of embolization in HBs located in the lower spinal region. In cerebellar, medullary, and cervical HBs, preoperative embolization is usually performed through the posterior inferior cerebellar artery, more rarely through the anterior inferior and superior cerebellar arteries, the dural branch of the vertebral arteries, the cervical arteries, or the external carotid artery branches (23, 26, 29, 30). In thoracic location, tumors are usually located in the posterior half of spinal cord, and in these cases preoperative embolization of the posterior spinal arteries is reported useful in reducing perioperative hemorrhage (36). Tampieri et al (26) embolized a patient with an intramedullary hemangioblastoma at T4. Eskridge et al (23) performed embolization in two thoracic tumors through the intercostal arteries. Presurgical devascularization of HBs through the ASA has not been reported. HBs located in the lower spinal region have a predominant vascular supply from the anterior spinal axis, as observed in all our cases. In the thoraco-lumbar region, the artery of the lumbar enlargement, the so-called artery of Adamkiewicz, is a radiculomedullary artery that in 80% of cases originates from T8 to L1 and is more common on the left side. When the origin is above T8 or below L1, an additional supply to the anterior spinal axis exists caudally or cranially, as observed in one of our cases (Fig 2). Vascular supply to the filum terminale is assured only from the anterior spinal axis, and this fact explains the predominant ASA vascular supply in tumors of this region. In our four HBs occurring in the conus medullaris, cauda equina, and filum terminale, devascularization was obtained by embolization performed through the ASA. Embolization of the anterior spinal axis, however, requires caution and can produce severe and irreversible neurologic damage. The size of particles must be chosen in relation to the size of vessels and tumoral structures to occlude. Very small particles can occlude normal small vessels, in particular sulco-commissural arteries, and overly large particles can produce ineffective proximal occlusion and damage of the ASA. Evaluation of hemodynamic changes during embolization is also mandatory. Criteria for ending the endovascular session were the same reported in particles embolization of the spinal arteriovenous malformation (57). In addition, it must be considered that tumors can displace normal structures and, in some cases, the ASA can be displaced off the midline and therefore can be confused with a posterior spinal artery. In these cases, lateral view angiograms are very useful in the exact identification of the spinal arteries. In our cases, the embolization caused no complications. One patient, however, presented a transient and moderate worsening probably due to edematous changes. The patient rapidly recovered under corticoid therapy. Eskridge et al (23), in their series including seven cerebellar and two spinal HBs embolized preoperatively, describe one patient with a posterior fossa HB and hydrocephalus who worsened clinically within 12 hours of embolization. This event was thought to be caused by obstructive hydrocephalus resulting from tumor swelling. Takeuchi et al (25) report no permanent neurologic deficits after embolization in eight cases of cerebellar HBs, but cerebellar infarction occurred in one patient. Conway et al, in their series—including one cerebellar, one medullary, and two spinal embolized HBs—reported one Wallenberg syndrome deficit in one case of medullary HB. The risk of embolization should be compared with the surgical risk in large and high vascular lesions treated surgically without preoperative devascularization. Using a meticulous technique, embolization of HBs of the lower spinal region can be performed through the ASA. This procedure allows a more avascular surgical field and is useful in aiding complete surgical resection of these highly vascular tumors. Outcome seems favorable for patients with HBs of the lower spinal region operated after embolization. Accepted after revision August 24, 2004.